Singapore’s Land Transit Authority (LTA) has announced the compulsory registration of power-assisted bicycles, locally referred to as e-bikes, commencing this month. Now all e-bikers have up to January 31th of next year to comply, and get a number plate for their ride or face the wrath of the LTA thereafter. The cost of the registration is just S$50 for now and this will be waived for registrations prior to November 15th. However, and in the usual Singapore government uncompromising style, the LTA has announced that the fine for those that fail to register will be S$2,000 and up to three months jail for a first offence. Guys, seriously, jail for possessing an e-bike? When you visit Singapore, you cannot fail to be impressed and somewhat jealous of the incredible transportation system, and in particular the public transportation system in the city state. For many years now, the Singapore government has been actively creating one of the world’s best public transportation systems, but like in other cities where there is an awesome bus and train service, there is always the problem with what is termed “the last-mile”, the distance between the station and your ultimate destination. E-bikes have become an essential part of many commuters daily journey as a result of this. 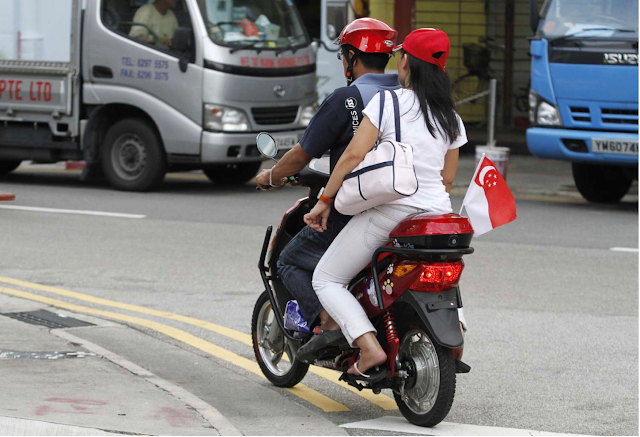 Sights like these three-seater bikes are becoming an everyday occurrence in Singapore. Apparently the e-bike has become such a popular mode of transport that the Active Mobility Panel, a government advisory group, suggested that e-bikes should be registered to facilitate enforcement against errant riders who illegally modify their bikes. There is also some concern about the proliferation of e-bikes causing accidents with pedestrians, particularly when reckless riders mount the pavements to avoid traffic. We fail to see how a registration will inculcate improved road manners from e-bikers. Nay, this seems much more like sour grapes from those who are resistant to new technology, or more likely a move by the Singapore government to rake in ever more revenues.